Apple’s decision to drop the 3.5mm headphone port from the iPhone 7 was one of its most controversial moves in years, but the Lightning port is a better option in many ways, and that’s never been clearer than with the new Rayz and Rayz Plus earphones from Pioneer. These feature-packed ‘smart’ earphones would ordinarily require a battery of their own, but as they plug in via the Lightning port they can be charged by your iPhone, iPad or iPod Touch instead. But they won’t drain your battery more than necessary, as they’re based on Avnera’s LightX platform, which allows them to operate in modes with the lowest power use possible. And in the case of the Rayz Plus model you can also charge your phone while they’re plugged in, by using the included in-line charging node, thereby solving one of the biggest problems of using the Lightning port to listen. Both the Rayz and Rayz Plus contain six microphones, which allow for ‘Smart Noise Cancellation’ – a feature which scans your ears to optimize the noise cancelling performance for your ears and environment, whether you’re commuting, at work, on a plane, at play or in school. There’s also a ‘HearThru’ mode, which lets a little outside noise in, so you’re not completely cut off from the world. The buds can detect whether or not you’re wearing them, automatically pausing your content when they’re removed and playing it when they’re put back on. Both models have a smart button too, which can mute the mics during a call, and be programmed to open apps or control other Rayz features. Programming the button is handled by a Rayz app, which also lets you personalize the settings of your earphones, and could get new features down the line via software updates. 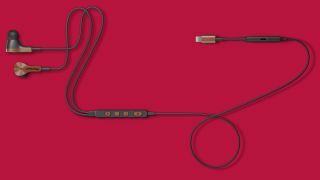 Pioneer claims that many of these features would not only be impossible to include with conventional 3.5mm earphones, but are also firsts for Lightning ones. If you like the sound of them they’re out now in the US, but being an early adopter isn’t overly cheap, with the basic Rayz costing $99.95 (around £80/AU$130) and the Rayz Plus retailing for $149.95 (roughly £120/AU$195). There’s no word on if or when they’ll hit the UK and Australia.